Faskally Wood is an extensive woodland area within Tay Forest Park on the banks of Loch Dunmore, approximately one mile north west of Pitlochry. Come inside the 'foresters' classroom' and discover a wide range of tree species, some more than 200 years old. The layout of the woodland is largely manmade, having been created in the 19th century in the grounds of Faskally House, which was used as a Forestry Commission school. Young foresters were trained to repair woodlands ravaged by felling for the war effort, and the wood was perfect for testing new ideas, including mixtures of different types of trees and creation of diverse woodland structures. Within Faskally Forest and close to the car park and picnic site, lies the wonderfully tranquil Loch Dunmore, with its boat house and picturesque timber footbridge. The woodland can be enjoyed on the many well sign posted paths including the easy access Dunmore Trail with views over the lochside trees or the Foresters' Trail around Dunmore Hill. 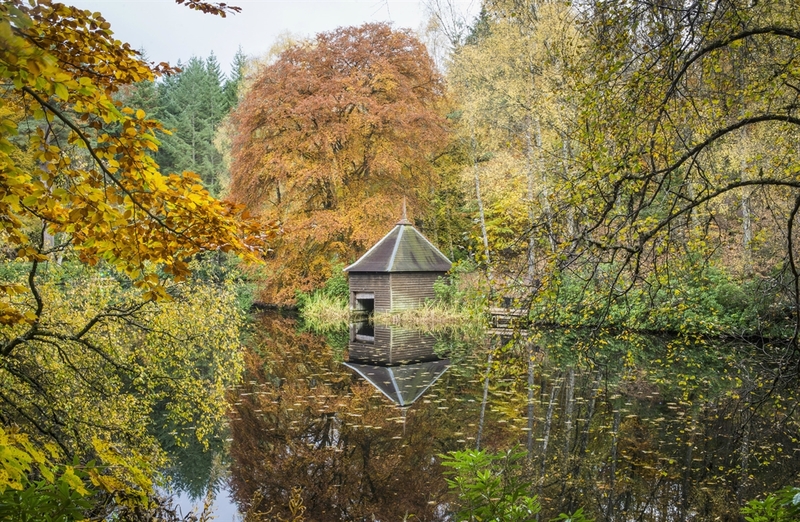 In spring the trees are bursting with fresh green buds and in autumn, reflections fill Loch Dunmore with shimmering colour. 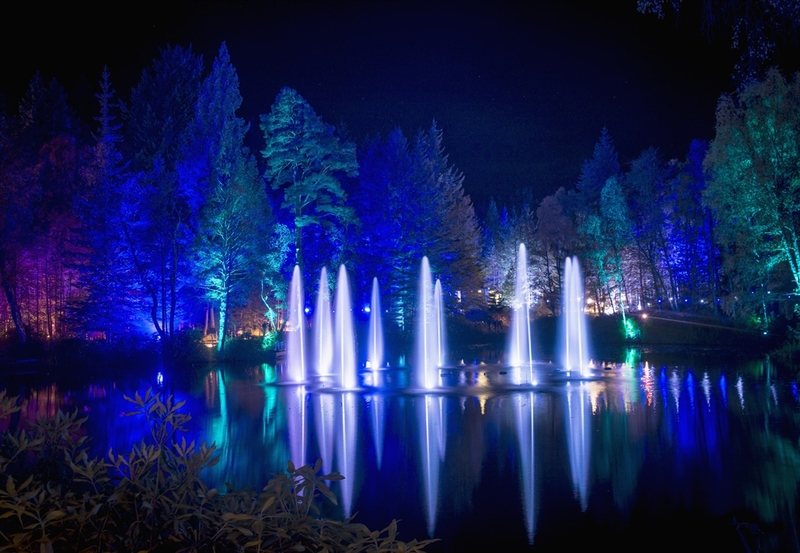 During autumn, Faskally Wood is transformed into The Enchanted Forest, with a light and music show, which illuminates the trees with beautiful bright colours. 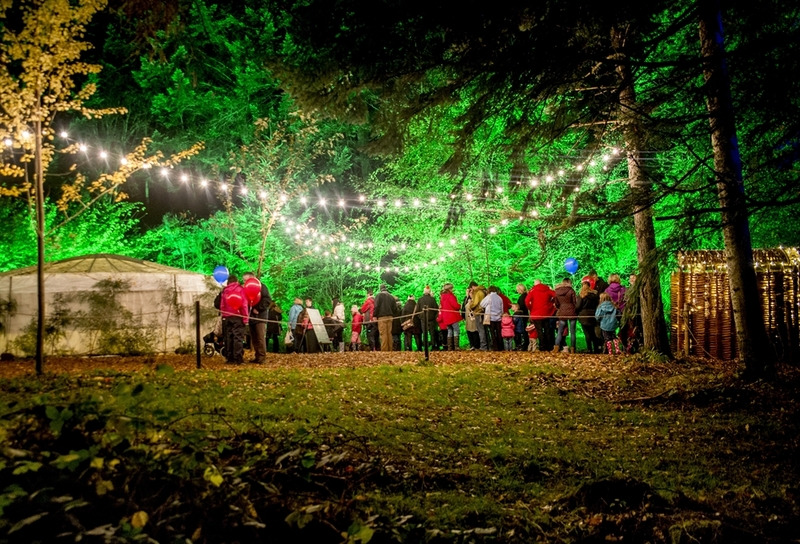 Further information is available from the Pitlochry VisitScotland iCentre. Getting there by railway:- Rail station at Pitlochry. From there it is possible to walk out to Faskally Forest. Getting there by aeroplane:- From Glasgow or Edinburgh airports travel north to the town of Pitlochry. The entrance to Faskally Forest is well sign posted just north of the town and can be reached either by taking the by-pass road or travelling through Pitlochry town centre. Getting there by ferry:- From the port of Rosyth follow the M90 to Perth and then the A9 north to Pitlochry. The entrance to Faskally Forest is well sign posted just north of the town and can be reached either by taking the by-pass road or travelling through Pitlochry town centre. VisitScotland / Kenny Lam, all rights reserved. Faskally Wood in autumn. VisitScotland / Kenny Lam, all rights reserved. Faskally Wood in autumn. VisitScotland / Kenny Lam, all rights reserved. The Enchanted Forest, Faskally Wood. VisitScotland / Kenny Lam, all rights reserved. The Story Telling Yurt at The Enchanted Forest, Faskally Wood.